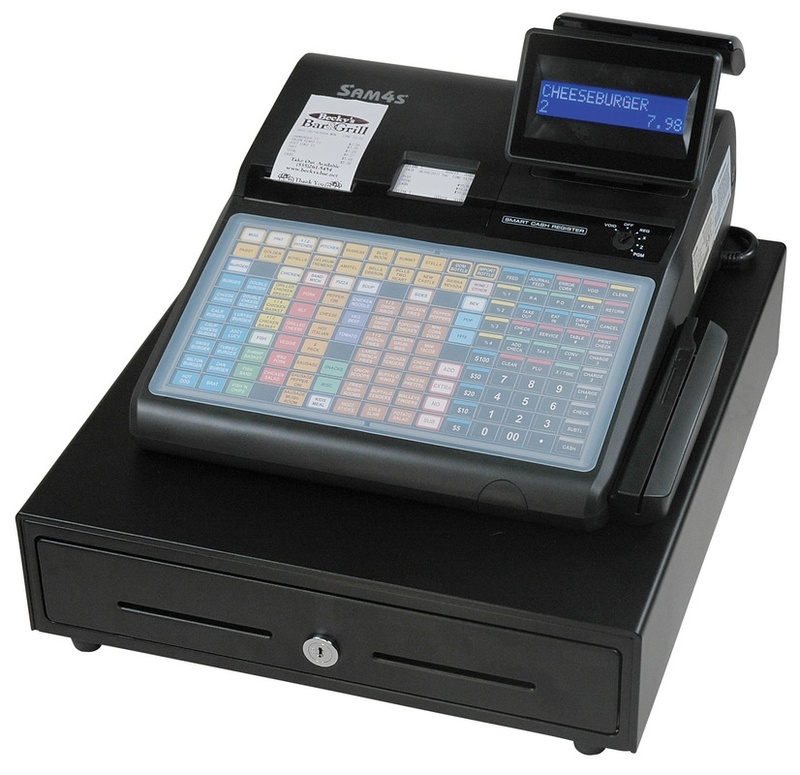 With it's unique black cabinet, this till will complement retail and bar environments, and is specifically designed for simple & quick sales.The Sam4s ER 265 also features a keyboard template that we will customize to your specific needs, making it easy to use and see.You can place up to 15 departments on the template along with whatever function keys you require. Discounts, Cash, Charge, No Sale, PO, RA and more. Plus this till features an alpha overlay, making any future changes very simple. Low cost, flat keyboard ECR with high speed thermal printing that can utilize a barcode scanner. The ER-285M is a commercial grade ECR featuring a full size heavy-duty steel cash drawer, POS-grade thermal printer, and key lock security for voids returns and reports. Two RS-232 communications ports for peripherals Kitchen Printer, Bar Code Scanner, Scale or Pole Display. An electronic journal captures transaction information and features 60 PLU category keys on the keyboard. 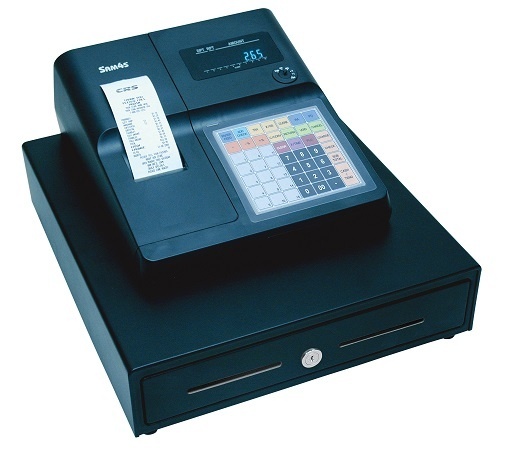 SAM4s has released the ER-900 Series cash register, multi-use ECR. The ER-900 series cash register offers a fast, reliable and quiet thermal printing in either a single-station model with electronic journal or a dual-station model with receipt and real-time journal. Drop-in paper loading simplifies paper changing and virtually eliminates paper jamming. The large two-line LCD operator screen is easy to read. As SD port is concealed under the printer cover to allow for easy upgrades without the risk of tampering. For top notch communication with peripherals, four serial ports are hidden behind a convenient access door for connectivity without clutter. This cash register can be used in any environment. This brand new cash regsiter replaced the very succesful Sam4s 650. You can choose a flat keyboard model for food service or a raised keyboard model for retail environments. On screen programming simplifies setup and makes changes easy to manage after installation. Connects to popular POS peripherals like scanner, slip printers and remote printers. Interconnect multiple units to consolidate your sales and share access to peripherals. Best Applications, Food Service: Quick Service, Sandwich, Deli, Kiosks, Cafeteria, Ice Cream, Retail Merchants Especially Retail Scanning • Simple Franchise Concepts• Parks, Stadiums, Convention Centres And Other Venues With Many Concession Locations. This cash register also has a 8 line display with running balance and tax totals, making it easy to keep track of what you are doing at all times. Featuring a hybrid design, SAM4s cash register has combined fast and simple ECR keyboard entry with an intuitive 7" touch screen operator display. The SPS-500 is easily configured for your food, beverage, or retail business and provides the functions and options you need to meet your point of service needs. The SPS 500 series has 107 PLUs on the keyboard, plus an extra 5000+/- available in memory, all while adding another 20 places on keyboard for various function keys. 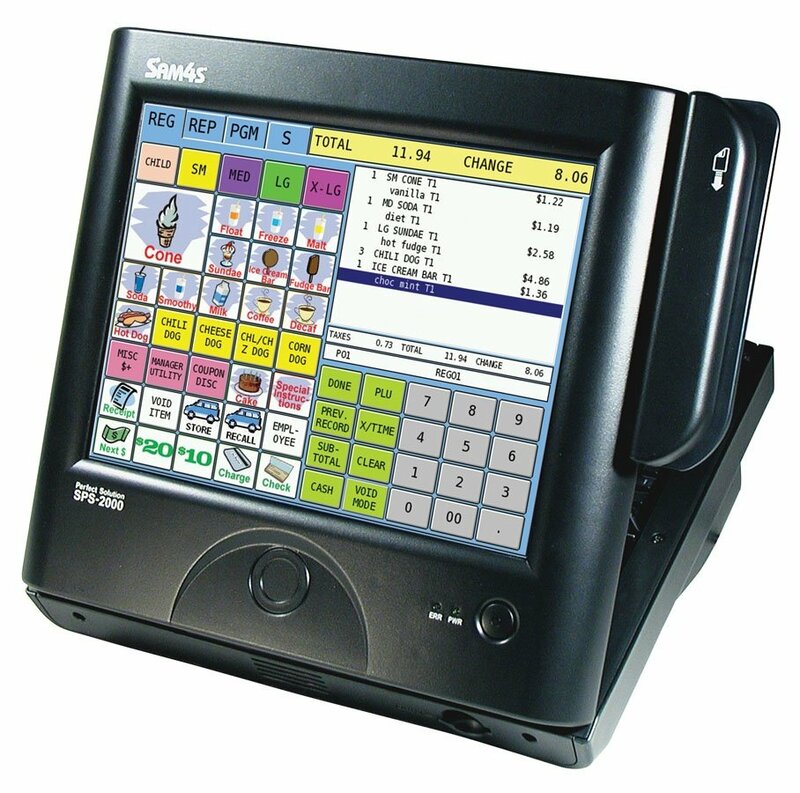 The SPS 500 cash register is like a point of sale terminal, it can store and recall tabs for sit down service restaurants. It is also great for programming menus with modifiers and condiments. Using PLU look ups, no menu is to large. Plus using a keyboard and touch screen keeps the layout neat, tidy and easy to use. It also feature a full 3" thermal receipt printer. 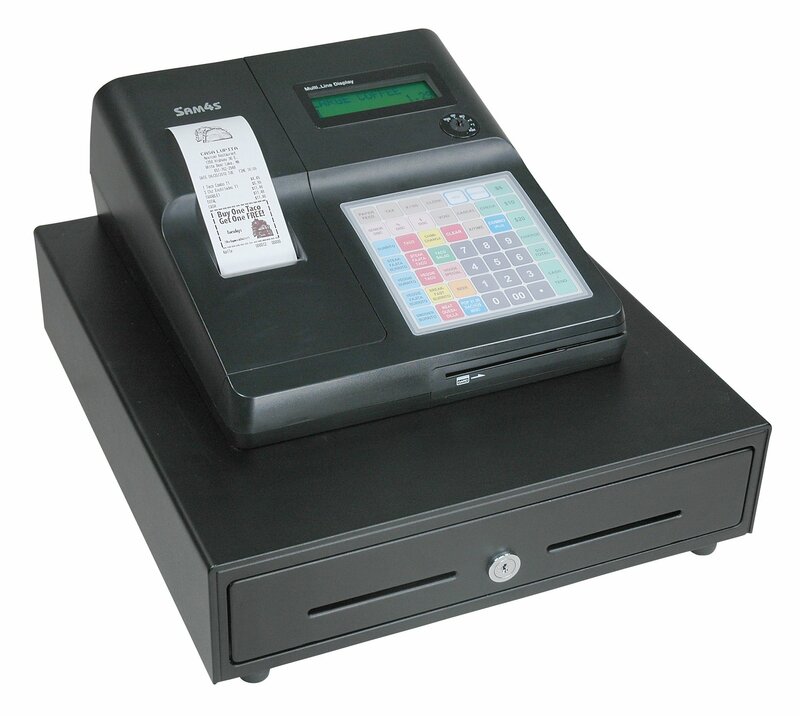 The SPS-2000 is easily configured to meet the needs of various table service, quick service and retail applications. It supports a full complement of POS peripherals, including printers, a comprehensive kitchen video system (KVS), POS scales, and scanners. 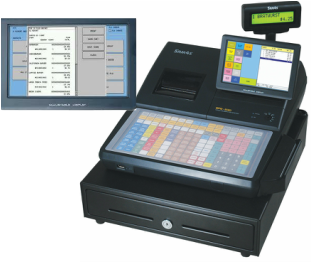 Like PC-based hospitality POS systems, the SPS-2000 features touch screen operation however unlike PC systems, the SPS-2000 has no hard disk drive, running its proprietary built-in application software from on-board flash memory and storing data on non-volatile RAM. This Electronic Cash Register-like design provides significant advantages in speed, reliability, recovery from power interruptions.